It’s probably a good thing that NASA’s pool of astronauts include quite a few military officers. Who better to understand the “hurry up and wait” lifestyle that is the military? We told you last month about preparations for the planned June 13 launch of the space shuttle Endeavour, whose seven-member crew of space sailors, including only the second Navy SEAL to ever venture into space, will do a 16-day mission that will haul parts of Japan’s Kibo laboratory to the International Space Station. But hydrogen leaks in a gas vent line leading to the exterior fuel tank forced NASA officials to twice scrub the flight and delay the mission. On Friday morning, though, NASA gave the STS-127 mission a “go,” with a scheduled launch time of 7:39 p.m. Saturday from the Kennedy Space Center in Florida. But at this point, NASA says, it looks like weather might be the decider on that evening launch time and date, since the forecast includes scattered thunderstorms throughout the weekend. 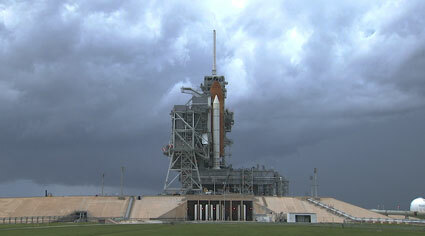 NASA predicted a 40 percent for conditions good enough to launch on Saturday. Endeavour’s crew for this planned flight has a strong, multi-service, “purple” representation: Navy, Air Force, Marine Corps and Army. Mission specialists including Cmdr. Christopher Cassidy, a Navy SEAL and Afghanistan veteran who will ride Endeavour on his first flight into space if all goes well with the weather and barring any other delays. Again, we say hooyah! Cassidy will follow on the heels of his mentor, retired Capt. William M. Shepherd, the first Navy SEAL to ride a shuttle into space. The Air Force is represented – shuttle commander Mark Polansky is a retired test pilot and veteran of two shuttle missions, STS-98 and STS-116 while mission specialist Dave Wolf[cqgf]is a former flight surgeon. So, too, is the Army, as mission specialist Col. Tim Kopra, a helicopter test pilot, will leave on his first flight and remain on the space station as he swaps out with Japanese astronaut Koichi Wakata, who will return to Earth with Endeavour’s crew. A Marine will be at the controls when Lt. Col. Doug Hurley, the shuttle pilot, goes on his first spaceflight. If the weather clears up, once the shuttle takes off, you’ll be able to track each of the day’s work on an interactive site. You also can read about what favorite tokens astronauts will take with them for their space ride. Cassidy is carrying several coins and patches from SEAL units. You can even reach them on Twitter. Polansky, the mission commander, is “Astro_127.” “We’ll have our L-1 day shuttle systems review and launch weather briefing at 2000 EDT,” he wrote Friday evening. You can track him on MySpace and YouTube.